This past weekend I got caught by what I call the “6 or 7 film barrage”. That’s where a TV channel will take a film and show it at least 6 or 7 times over a span of several days. The pattern will usually go something like this, once on Thursday, once on Friday, twice on Saturday, and twice on Sunday, sometimes with one more broadcast tossed in somewhere for good measure. On top of that, one of the days where they broadcast the movie twice, it will be shown back to back. 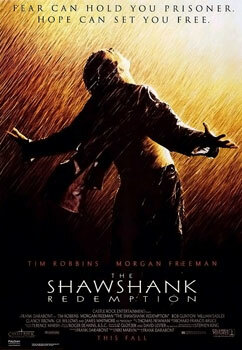 The movie this weekend was Frank Darabont’s The Shawshank Redemption. After stumbling across it several times channel surfing, I finally landed upon it at it’s begin and decided to give it a re-watch (I guess that’s part of the network’s master strategy, toss it at you enough times and sooner or later your resolve will break down) even though I’m not usually a fan of the cuts and edits network TV will normally do to films. Released in 1994, The Shawshank Redemption tells the story of an intelligent banker named Andy Dufresne (Tim Robbins) who is convicted of murdering his wife and her lover, and sentenced to 2 life terms in Shawshank prison. Once there, he meets Ellis Boyd “Red” Redding (Morgan Freeman) with whom he begins a friendship with along with Red’s circle of inmate friends. The movie is filled with themes of man’s attempts to find hope and dignity in an impossible situation; which Andy finds himself in when he’s pulled into service by Warden Samuel Norton who uses Andy’s expert banking skills to launder money Norton is receiving for using the prison inmates as skilled labor in the public sector. The movie has a couple elements that make the it note worthy. First, it was based on a novella by Steven King entitled, “Rita Hayworth and the Shawshank Redemption” that was published in his 1982, “Different Seasons” collection. Also the movie began what I call, “the Morgan Freeman” narration. The scenes of the movie are tied together by a voice-over performed by Freeman’s character Red. Freeman’s deep, non-wavering voice throughout the movie has become iconic and has been parodied on everything from TV commercials to Family Guy. One of my favorites however is Clancy Brown who, as Chief of the Guards Captain Hadley, delivers one of the best profanity laden performances in a movie by a non Drill Sergeant character. The movie benefits from a stellar cast. Robbins and Freeman are both excellent in their respective rolls, and Bob Gunton is superb as Warden Norton. One of my favorites however is Clancy Brown who, as Chief of the Guards Captain Hadley, delivers one of the best profanity laden performances in a movie by a non Drill Sergeant character. Sadly, you miss out on this on network TV as most of Brown’s tirades are either cut or overdubbed. The Shawshank Redemption was nominated for seven Academy Awards including best picture and best actor (Freeman) but sadly went home with none having been over shadowed that year by Forrest Gump. So which beer are the men supposed to be drinking on the roof ? The movie never says. But if you compare the images below, I think we can make a strong case for what the movie makers thought was Andy Dufrense’s “bottle of suds” of choice. Left and Center: Screen shots from Shawshank Redemption. Right: Post 1950’s Stroh’s beer bottle label. While The Shawshank Redemption might not be for all people with its hard look into prison life and rough language, I highly recommend it. Its gripping story, excellent acting and Oscar nominated cinematography make it a definite American classic. Just make sure you have some ice cold Bohemian style beer to go with the popcorn. That’s a great scene. Thanks for the reminder (and the eagle eye research on the label). Thanks. This was one of my fav posts to write for sure. Thanks for stopping by my blog! I just won a beer bet knowing that it was Stroh’s. It is going to taste almost as good as the beer did to the men on the roof. One of my all-time favorite movies. I absolutely agree that it’s a Stroh’s label in that scene, but I don’t think it would have available in Maine in 1949. Good point on the availability. To be honest, I never considered it, but you’re probably correct on that.